With 3:36 remaining in the game, A.J. Jacobson stepped up to the free-throw line, looking to complete a three-point play. With the Bison trailing three, Jacobson got to the line, looked up and saw flashing lights. The fire alarm was going off. The lights were flashing, and a recording of a woman claiming, “A fire has been reported, please leave the area while this is confirmed,” blared over the PA system. Somewhere, there was a health and safety person pulling their hair out, as very few left their seats. Nope, the student section stayed and made some noise. The PA announcer told the players to return to the locker room, both teams stayed put. There was no evidence that there was any danger. It ended up being reported by NDSU that smoke from the cleaning of concession stand tripped a detector. As for the influence on the game, the Bison head coach David Richman took the neutral route. Khy Kabellis was a little more grateful for the alarm. “It made for a nice little break, we got some fresh legs after that,” Kabellis said. It is usually a toss-up on who will dominate the momentum after a stoppage like that. The fans tried their best to keep the energy up, NDSU responded. The quick little run by the Bison was enough to get the win. But the bigger question remains, are there are fire issues in the SHAC? It is hard to say definitely that there are. The SHAC is a $50 million project, done to modern codes. The architects, T.L. Stroh and 360 Architecture, haven’t had problems before. 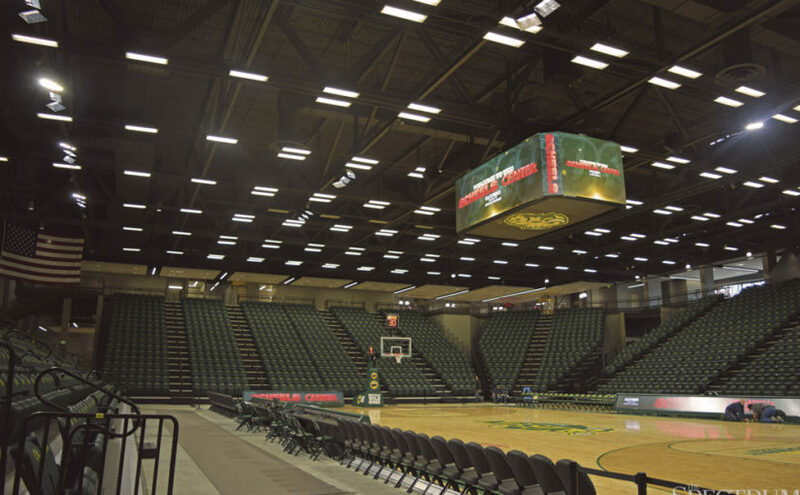 But this is not the first time a fire alarm has affected the fans at a basketball game, as a game in November had one go off about an hour before tipoff. It is usually not a good sign when there are two fire alarms in a span of two-and-a-half months of opening. Here is to hoping this is just a flash in the pan, and the fire alarms aren’t going to go off again.